This morning (Friday 31 July, 2015), UNC Campaign Manager Rodney Charles spoke in front of John Donaldson Campus to expose Keith Rowley’s jobs plan for Trinidad and Tobago. 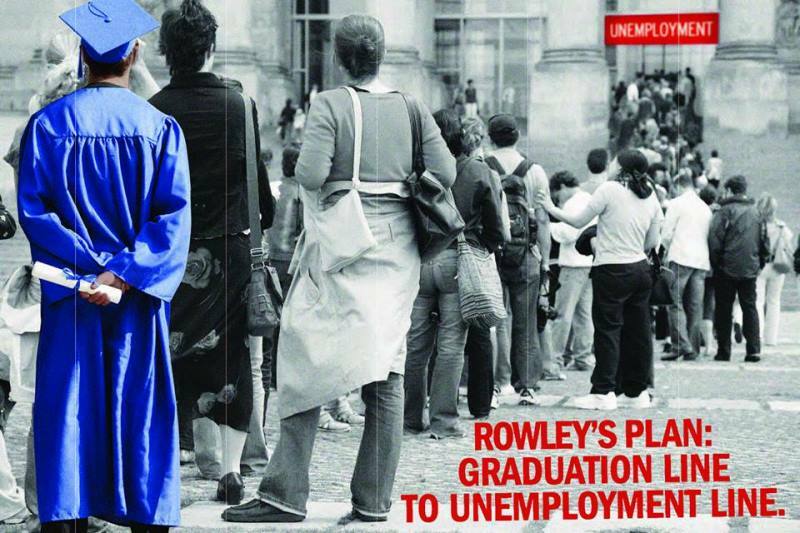 “Under Keith Rowley, it will be from the graduation line to the unemployment line for our young people,” said Mr. Charles. “Keith Rowley will make painful cuts to the programs which have helped reduce unemployment to the lowest levels in our history to pay for his vanity projects, like his $60 billion dollar railway”. It has been 278 days since Keith Rowley promised to unveil his plan for Trinidad and Tobago and so far we having nothing except veiled references to significant cuts to social programs and wild vanity projects like his $60 billion dollar railway. “The election on 7th September presents voters with a clear choice between Prime Minister Kamla Persad-Bissessar, who has a plan and a vision to improve the quality of life for every person in Trinidad and Tobago, and Keith Rowley, an angry, arrogant with no plan and no vision,” said Mr. Charles. Keith Rowley will turn back the clock on the important achievements of the last five years, including eliminating programs that have helped reduce unemployment to the lowest levels in decades. The previous government presided over high levels of unemployment during their time in office. Under the leadership of Prime Minister Kamla Persad-Bissessar, the unemployment level has nearly been cut in half.